Villa Ana Margarida – Note the Gaudi-esque architecture. The winter in Maine was long and cold, but the anticipation of a trip to Portugal in May for the Advanced Surfing Life Support gave me hope that I’d make it through. The course was held May 5-10 in Ericiera, a half-hour from Lisbon on the beautiful Portuguese coast. The event was sponsored and coordinated by the European Association of Surfing Doctors and took place at the Villa Ana Margarida. The conference exceeded my expectations in every way. Its five action-packed days started at 9 a.m. and finished at 6 p.m. Each day had a varied schedule but typically included a mix of clinically relevant travel and surf medicine lectures with water-based training in life-saving techniques. The evenings provided time to socialize and walk or drive to the center of town for local Portuguese food. Lisa Farrell looks down at the break below conference headquarters. Lectures covered topics such as drowning, hypothermia, musculoskeletal injuries, rescuing techniques and theories about waves, tides and rips. There were lectures on water disinfection, dental problems, orthopedic injuries, splinting and dislocation. There was a lecture by Ireland’s big wave surfer, Peter Conroy, discussing his experiences in water safety and a spine injury he suffered while surfing the waves at Mullaghmore Head. SMA’s very own Andrew Nathanson, M.D. offered lectures on clinically relevant surf topics such as stings and envenomations, wound management, and laceration repair. 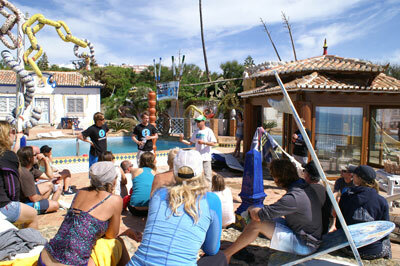 The lectures offered well-organized material clinically relevant to the practice of surfing medicine. Practical training included hands-on instruction in providing acute life-saving care to the injured surfer. The staff included certified lifeguard instructors, wilderness medicine physicians, Emergency Medicine physicians and experienced surfing doctors. Training included the use and preparation of medical kits using readily available materials for splinting and immobilization. Extraction of the injured patient was performed in active surf conditions with an emphasis on safety and an organized approach to resuscitating the critically injured victim. The scenarios included individual and multi-trauma settings using available resources for water extraction and spinal immobilization, splinting and prevention of hypothermia. The clinical scenarios brought the information from the classroom lectures to a realistic setting that helped to solidify the learning experience. Nathanson (L) and Farrell (R) heading down to the left at Foz do Lizandro. The conference was physically demanding, given the combination of lectures and practical training. The course is accredited for 32 hours of CME credit and the participants earned each one of these. I managed to escape for a two-hour surf session each morning before class, or for a sunset session in the evenings. The local surf breaks include Ribeira D’ilhas (my favorite), Coxos, Sao Loureno, Foz do Lizandro and Sao Juliao. 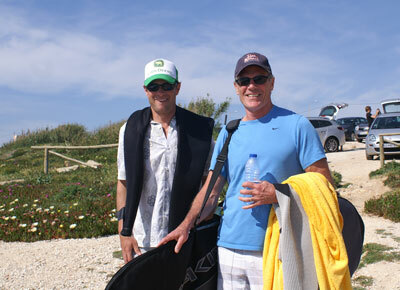 We had training one day further south in Cascais, and surfed in Carcavelos. Several participants made the drive to Peniche and surfed Super Tubos, annual host to the ASP tour. The conditions were favorable, with wave heights consistently in the 4 to 7 foot range with 11-second intervals, air temperature of 65 to 70 degrees Fahrenheit, and the water was 61 degrees. I was able to wear a Patagonia 3 mm wetsuit for a one-to-two-hour session without getting cold. It has been a long, cold winter, with 7mm gloves and booties, so I was glad to leave them behind. 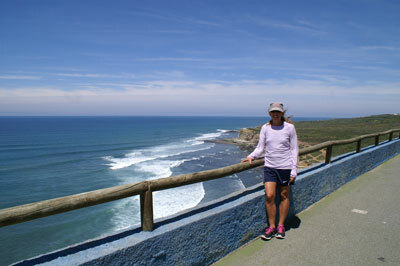 The town of Ericeira offers a variety of restaurants (63 listed on TripAdvisor) and nightlife. Based on a limited sample of five nights, our favorites were the restaurant Prim, Tik Tak and Esplanada Furnas. The nightlife was active, but the day’s activities encouraged a reasonable bedtime each night. The local seafood was fresh and the pastry shops plentiful. We rented our boards from Ericeira Surf Center, directly across the street from Villa Ana Margarida which stocked good-quality fiberglass short boards made in their shop, as well as a variety of long boards. The owner gave us a clear understanding of the local breaks and conditions, and the rates were discounted for conference participants. There is a Board Rider Quiksilver store across from the Vila where we had a welcome gathering and a closing party at the end of the conference. This store had a café, which served lunch and great coffee, as well as an impressive skate park with two bowls, banks and step-ups in a large outdoor area. The terrace behind the store overlooks the skate park and a beautiful open ocean view. 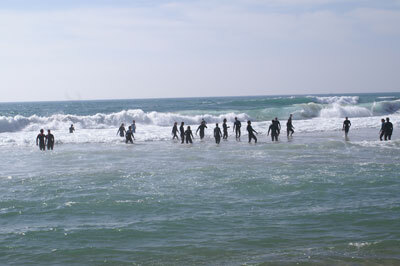 Course participants return from a long open-water swim. I can safely say that Vila Ana Margarida is unlike any other Oceanside resort you will ever visit. The Vila has 12 uniquely designed traditional fisherman houses with Portuguese and Gaudi influences, designed and constructed by the owner over a 20-year period. The units are surrounded by private gardens, with a swimming pool and open ocean views. It is located right on Matadouro surf beach. The owner, Margarida Casado, and his son-in-law Hugo Augusto made every effort to accommodate the conference and our hectic schedule. The conference participants were the only guests during our five-day stay, which made for a relaxed community experience. The property is home to several other species of animals, with peacocks, goats and chickens offering a background symphony to support the local birdcalls. This was the second conference I had the fortune to attend in Portugal in the last year, each sponsored by the European Association of Surfing Doctors. I am impressed by the dedication of this group of young physicians and medical practitioners whose goal is to advance the practice of surfing medicine. The attendees were from a variety of medical fields including physical therapy, orthopedics, anesthesiology, emergency medicine and pre-hospital care. It was a truly international group, with participants from Italy, Ireland, Austria, the Netherlands, Germany, England, United States, Portugal, Norway, Denmark and Spain. One of the highlights of the conference was a “Battle of the Nations,” an impromptu singing contest that the Irish claim to have won but is still being debated. Completion of the conference was followed by written and clinical testing resulting in a Certificate of ASLS proficiency, 32 CME credits and wonderful memories of the experience to last until the next conference in September 2014. The EASD conference on Surfing Medicine will be held Sept. 9-13 in Sligo/Mullaghmore, Ireland.